Situated in Paphos, Cyprus, the Aliathon Holiday Village offers families and couples high-quality holidays amid a tranquil oasis. The hotel boasts a variety of leisure and recreational facilities, with four fantastic outdoor pools (including the largest in Cyprus), tennis courts, an archery range, a mini waterpark with slides, and a unique High Rope Park with rope climbing and trained acrobatics - so guests are never short of entertainment. There is an extensive list of eateries on-site including Pantheon Restaurant, Aegeon Greek Restaurant, Casa Del Sol Mexican Restaurant, Mare e Monti Italian Restaurant and more, which provide guests with a medley of delicious international cuisines to enjoy day and night. For ultimate R&R, visit the Faros Spa for a variety of treatments, the steam room and sauna, and fitness centre. 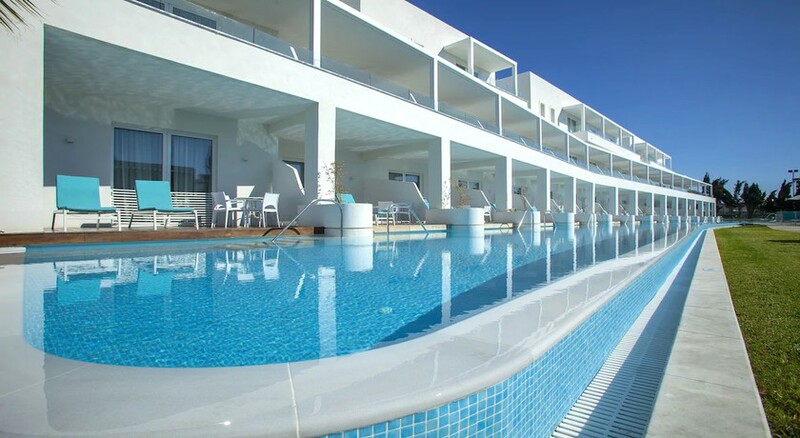 The Aliathon Holiday Village is ideally located in the resort of Kato Paphos, in Paphos, Cyprus. 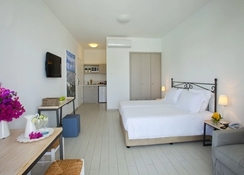 It takes about 15 minutes to drive from the Paphos International Airport, and the balmy beach is only 150 meters away. The historical fort of Paphos and the picturesque fishing harbour are also close by – perfect for strolling through. 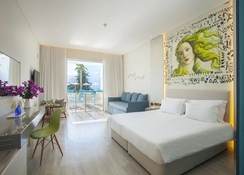 The hotel features 329 elegant apartments comprising of one-bedroom and two-bedroom independent apartments, which are designed leveraging conventional Greek Island architecture. These rooms can accommodate up to 1000 guests at the same time. 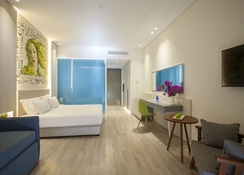 All the rooms are air-conditioned with fully-fledged kitchens, balconies and private terraces. Wi-Fi internet connection and all the necessary amenities are also provided to the guests. The rooms are set amidst beautiful gardens comprising palm, orange, olive and lemon trees. There is a wide array of dining options in the hotel, which includes a main Patheon Buffet Restaurant, two restaurants and Karnayio Snack Bar. Apart from this, there are four pool bars providing all kinds of drinks, cocktails and snacks. Those who want to indulge in drinks at night can head to one of the three night bars offering wide-ranging drinks and cocktails. If you want to try Greek, Mexican or Italian Cuisine then you can go to Aliathon Plaza that is right in the front of this holiday village. It operates one of the best restaurants in Paphos which includes the Mezedogonia Cypriot Taverna, the “Mare e Monti” Italian Restaurant, Aegeon Greek Restaurant and the Poco Loco Mexican Cantina. The Aliathon Holiday Village offers guests state-of-the-art sports and fitness facilities that include floodlit tennis court, archery range, mini-football court, table tennis, games rooms, and on-site scuba diving. 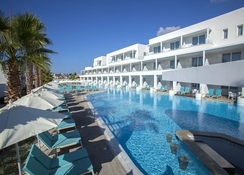 The hotel has four large swimming pools that include the largest swimming pool in Cyprus, too. The hotel also features a mini waterpark offering several water slides, where the younger guests can have unlimited fun. There are a plethora of activities available for kids and teenagers too, with a Kids club, crèche and teenagers club featuring different animations and activities. The High Rope Park in this hotel is the one and only in Cyprus, where the guests can do acrobatics and rope climbing under expert supervision. Guests who want to relax and maintain their fitness level can head to the fully-fledged fitness centre that encompasses a sauna, steam bath, three spa treatment rooms, hair salon and an indoor swimming pool with a whirlpool. If you're looking for holidays in a holiday village, Aliathon is sure to satisfy.